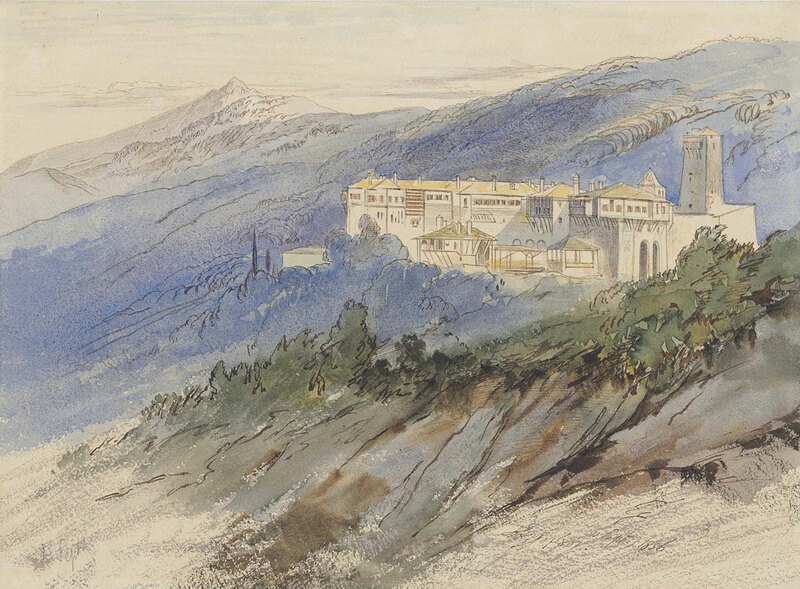 Edward Lear, The Monastery of Koutloumousiou, Mount Athos. signed with monogram, indistinctly inscribed in Greek and dated ‘Sept.1.1856.’ (lower right) and dated again ‘1.Sept’ (lower left, in pencil). Pencil, pen and brown ink and watercolour. 9 1/8 x 12 ½ in. (23.1 x 31.7 cm.). The monastery was built on the north east side of Mount Athos and was first documented in 1169. It ranks 6th in the hierarchy of Mount Athos. Anonymous sale; Sotheby’s, London, 12 March 1987, lot 116.
with Agnew’s, London, where purchased by the present owner.